Kimberly Yupa, right, and Bryana King work on their attraction for the Epic Park project during the Amazing Girls Science Camp Invention at Nathan Hale Middle School in Norwalk. NORWALK, CT – June 7, 2017. 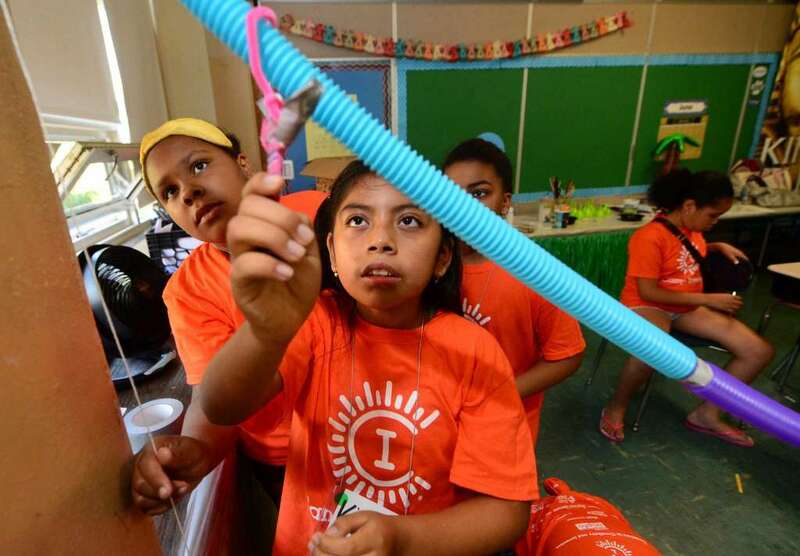 With summer vacation on deck, a new report published Tuesday and sponsored by the American Camp Association estimates at $212 million the economic impact of just over 500 summer camps operating in Connecticut. The state’s camps employ 800 people full time and another 13,600 seasonal workers, most of the latter number under age 25, according to the ACA report based on research by economist Charles Lawton. Connecticut camps draw about 33,000 visitors from out of state, Lawton estimated, with those parents spending $10.7 million during visits. New York has the largest camp “economy” in the region at $1.3 billion annually, with New England just short of the $1 billion mark, New Jersey at $525 million and Pennsylvania at $410 million. Parental options run the gamut in Connecticut from neighborhood day camps offering varying activities; to learning-oriented sessions at institutions like Norwalk’s Maritime Aquarium or Stepping Stones Museum for Children; to sleepover adventure camps farther afield that include — yes — camping. And Connecticut is exporting to the world a singular institution that is the legacy of the late actor and Westport resident Paul Newman: the SeriousFun Children’s Network that runs free camps for kids requiring ongoing medical care, with more than 730,000 kids having attended at last count and the organization’s expense budget totaling $17.9 million in 2016. Newman created the concept in 1988 with his original Hole in the Wall Gang Camp in Ashford, with SeriousFun camps operating in the United States, Africa, Europe and Asia. More locally in April, Norwalk ACTS announced the Team Summer initiative to help parents find summer experiences for their kids, creating a database online at that can be searched by program, dates and age ranges. Norwalk ACTS said its research showed that about 3,500 children in the city engaged in some type of summer programming, of close to 14,000 total ages 3-18. And the American Camp Association provides a “find a camp” tool online at find.acacamps.org that allows families to plug in criteria they require, including location and cost. For parents who do not have their children enrolled in a camp this summer, Norwalk ACTS advises them to get their kids involved in educational and active doings this summer, whether artistic and creative activities, hikes, trips to museums and other attractions, or simply free play outside.